I missed last week's weekly update since we were in NYC, but it would've probably read much the same as this one. It looks like I'm past the "morning" sickness stage of things now. I was still feeling nauseated last week but not bad enough to need to wear my bands, and this week I've felt just fine except for a couple of waves of nausea. I even ate a salad - and enjoyed it - last week! I used to look forward to my daily salad, so that was something I found weird and a little sad when it started turning my stomach. I'm still eating it with ranch dressing (since *everything* tastes better with ranch), although maybe I'll even get back to my normal Italian dressing too. Two other big milestones: I am done with my meds! Sunday was actually supposed to be my last day on the Endometrin and estrace, but I ran out of the Endometrin on Wednesday and just decided to stop them both. Possibly related to the meds but most likely just coincidental: I stopped spotting! For the most part, at least. I was afraid stopping the meds was going to lessen my symptoms and make me start getting nervous again, but the spotting was one thing I was glad to see go. Besides that, I have plenty of other symptoms to choose from, so I'm cautiously feeling good about things now. I'm still nervous for my NT scan tomorrow, but I really won't be surprised if I'm nervous before every ultrasound right until the end. 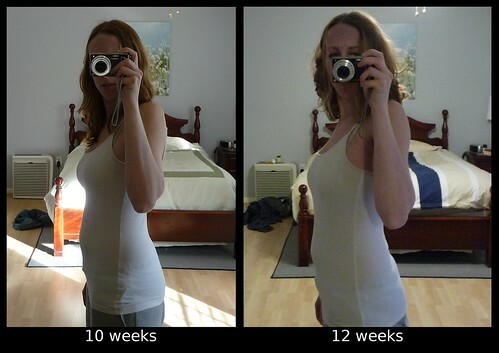 I really can't tell if I'm actually any bigger this week than in the 10 week pic, or if it's just because I'm closer to the camera this week. I've read that I should start showing any time now, so hopefully it'll be sooner rather than later!